Well, I finally started my 2013 taxes yesterday. After about a gradual but steady five-year decline, BAA gross income rose quite significantly in 2013. 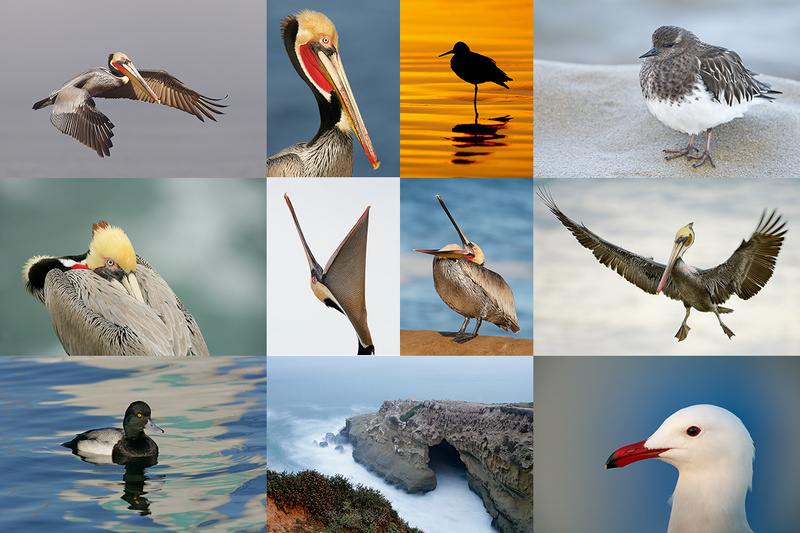 So here is a big-time thank you to everyone who patronized BIRDS AS ART that year (and since!). I am never, however, sure how total receipts affect the bottom line until I finish my taxes. Why? High end international trips raise the gross income but usually require large payouts on our end for a variety of expenses that we incur but are included in the IPT registration fees. Examples would be the cost of hotels and meals, the cost of hiring guides, charter fees (for the Galapagos, Bear Boat, and other trips), and the cost of boat trips as on the UK Puffins and Gannets IPT. That said up is always better than down so thanks again to all of you who have partaken. This blog post, the 297th in a row, took me close to 4 hours to prepare. It was published just after 8:30am from my home in Indian Lake Estates, FL. 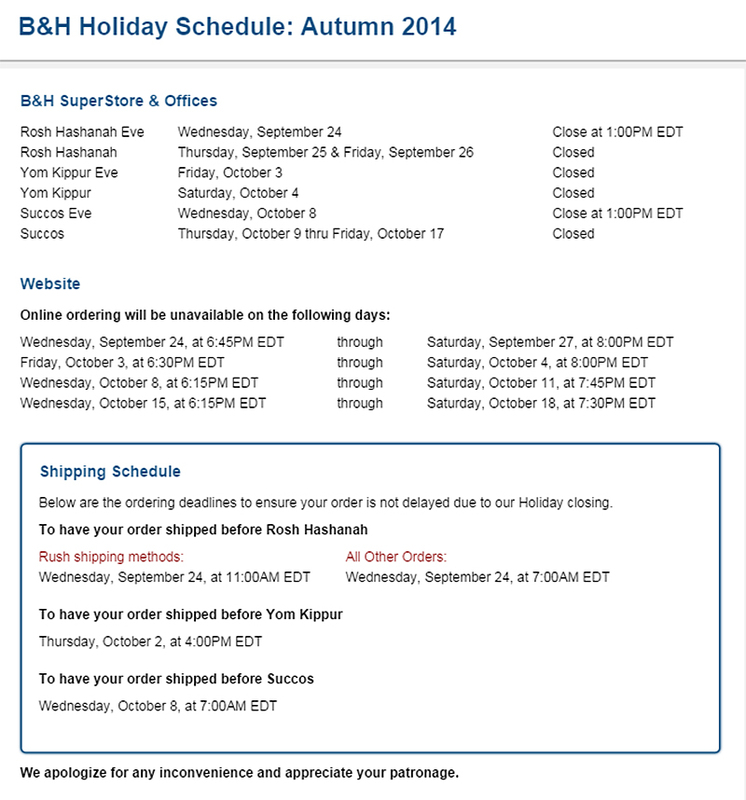 B&H 2014 Holiday Closing Schedule and Info. Join me in saying Happy New Year/L’Shana Tova to all of our good friends at B&H Photo Video, including and especially the folks who take care of my affiliate account needs, Yechiel Orgel, Izzy Flamm, and Jeosef Brown. Above, for your convenience, please find the 2014 B&H holiday closing schedule and info. I am thrilled that I continue to be inundated with requests for and comments on my Health Basics File. If you missed the original notice on that please see Saturday’s blog post here and the important follow-up yesterday’s blog post here. If you would like a copy of my Health Basics File, please shoot me an e-mail with the words “Health Basics File” cut and pasted into the Subject line. Huge congrats to Guilder Rodriguez now of the Texas Rangers. After 13 minor league seasons and 4000+ minor league at bats he got his first major league hit last night. He followed that with his second major league hit, a game-winning rbi single. His Dad and his wife were in the stands. Read the whole story and see the video here. This image was created in LaJolla, CA. I am not honestly sure if I hand held for this image or if I used the Gitzo 3532 LS carbon fiber tripod and my beloved Mongoose M3.6 head. Either way, I did use the Canon EF 200-400mm f/4L IS USM Lens with Internal 1.4x Extender (with the internal TC in place at 400mm) and the Canon EOS-1D X. ISO 400. Evaluative metering +2/3 stop as framed in cloudy bright conditions: 1/1600 sec. at f/6.3 in Manual mode. 61-Point/AI Servo/Rear Focus AF had an array of 3 sensors active at the moment of exposure. 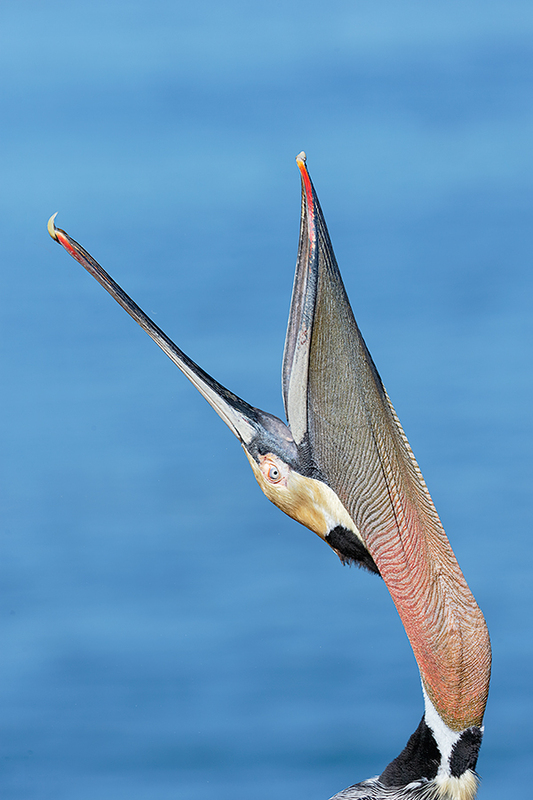 One of those barely caught the top of the pelican’s head–see the BreezeBrowser screen capture below. Click here if you missed the Rear Focus Tutorial. Click on the image to enlarge it and see the problem with the eye. #1: The image is sharp, but not tack sharp. As I recall focus was not quite locked…. In addition, I believe that there is a bit of motion blur. As detailed in the fairly recent “Head Throw Photography” blog post here, photographing head throws is quite challenging with acquiring and maintaining focus at the top of the difficulty list. When I return to San Diego in late January I will likely go with Central Sensor Surround for the head throws. #2: As luck would have it, the bird’s nictitating membrane was in place at the moment of exposure. See the animated GIF below for the before and after close-ups. #3: There image was not framed perfectly. (See #2 on the head throw photography difficulty list.) There is a bit too much room on the right and a bit too little room on the left. Above is the BreezeBrowser Main View screen capture for today’s image. Note that the illuminated red squares show the sensors that were active at the moment of exposure and that only one of the active AF points caught any part of the bird. (That due to operator error.) In BreezeBrowser you need to check “Show Focus Points” under View to activate this feature. To see the focus points in DPP V 3-point whatever check “AF Point” under View or hit Alt L. To learn how and why I use DPP (Canon Digital Photo Professional) to convert my RAW files, see the info on our DPP RAW Conversion Guide here. The DPP 4.0 RAW Conversion Guide that I am working on with Arash Hazeghi is nearing completion. Note the perfect histogram with the small amount of WHITEs well into the rightmost histogram box and none of the dark tones clipped. Regular readers know that I use and depend on BreezeBrowser every day of the year. It allows me to sort my keepers and delete the rejects faster than any other Windows browsing program. We use it on the main computer in the home office to catalog our images file-drawer style. 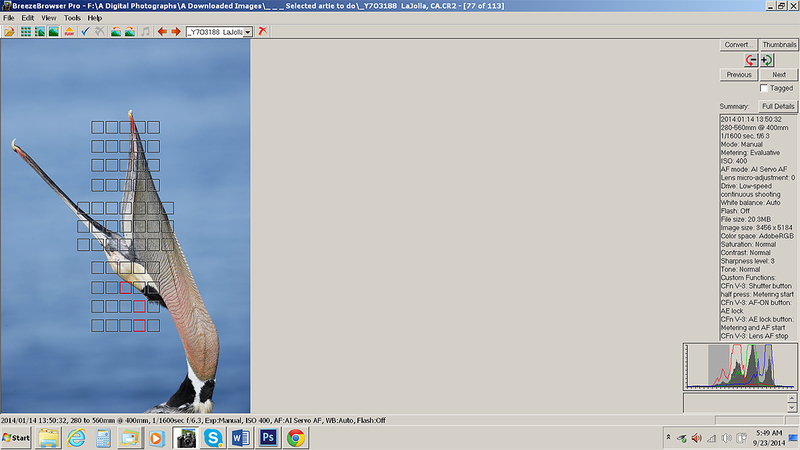 And the companion program, Downloader Pro allows me to download my images quickly and conveniently. It automatically adds my IPTC data and the shooting location. I have it set up to create a folder named by the Month/date/year. The Breezebrowser/Downloader Pro combo saves me many hours each week. To learn more or to purchase this great PC only program, click here. As far as the BreezeBrowser/Downloader Pro Combo goes, if you are using a Windows platform and are not using these two great programs you are at best, wasting your valuable time. Jennifer is loading Parallels onto my new Mac laptop today, that followed by a licensed copy of Windows 7 and then BreezeBrowser Pro and Downloader Pro. See BreezeBrowswer on a Mac for additional details. This is the optimized image that was created from the original image that opened this blog post. First the image was converted in DPP 4.0 and then brought into Photoshop CS-6. I reconstructed and sharpened the eye using a variety of Digital Eye Doctor techniques, the Clone Stamp Tool, and several tiny Quick Masks (the latter refined via a Regular Layer Mask. I ran my NIK Color Efex Pro recipe on the bird only (selected with the Quick Selection Tool) and then sharpened that layer with a Contrast Mask. Then I quickly and easily moved the bird to our right using techniques from APTATS II. The before and after animated GIF above gives you a close-up look at the changes made in the eye and the face. Best to you for the upcoming year. Good health is number one on the list. 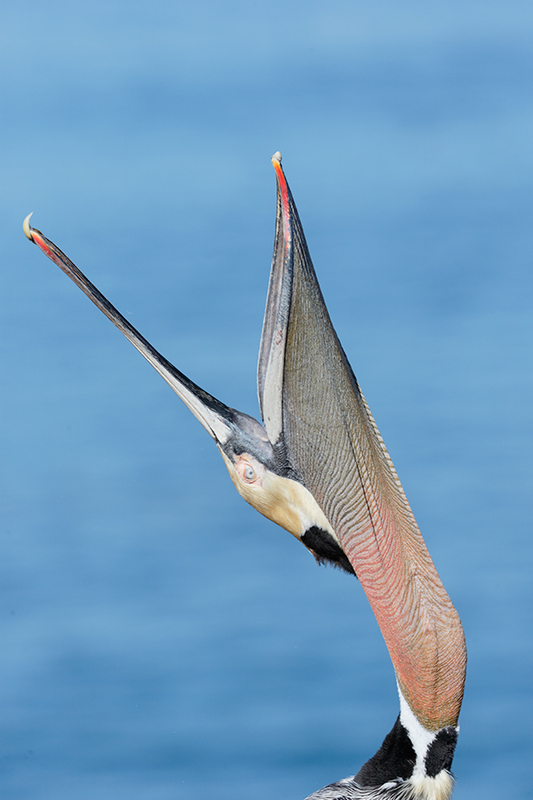 I found your information on the LJ Pelicans very informative, especially since I live over the hill in University City. I am a Nikon user and I was wondering if you have ever written about the Nikon names of AF that are similar to Canon’s AF settings. You thought that…”When I return to San Diego in late January I will likely go with Central Sensor Surround for the head throws.” I was wondering if you knew what would be a similar setting in the nikon system. Is it similar to the new Group setting? 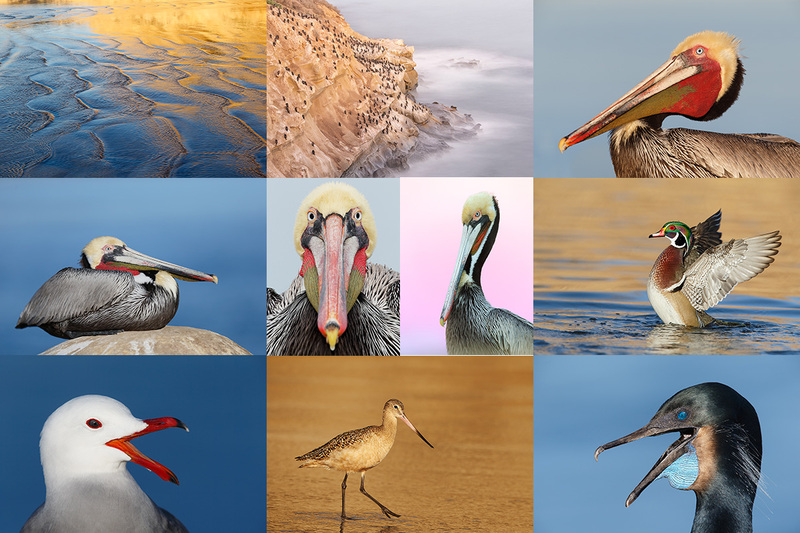 I plan to see your presentation at the Natural History Museum and enjoy the displayed images. Thank you and the blogs are just fabulous and appreciate the hard work and hours that goes into their production. Hi, I’m not finding the “Do see “DPP 4.0 Request for Help” above” section you mentioned. Was this a proofreading request? Hi Art, With reference to your use of DPP, Breezebrowser and Photoshop: I do not understand why you never mention Photoshop Lightroom! Seems to me it would cut down your workflow and processing time significantly if you used Lightroom for organising and primary processing instead of DPP + Breezebrowser + Photoshop to obtain end result. I do use your DPP guide on occasion for “problem” photos but find Lightroom is best otherwise. Do you have a reason for not using Lightroom? Love your blog and your books, you’ve taught me a lot over the years! As always I ask, what can Lightroom do that I cannot do?